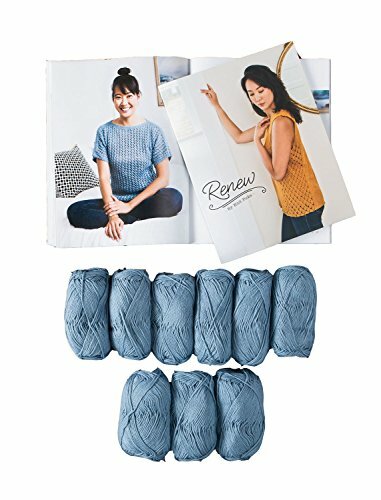 Renew knitting pattern book, which contains Simple Lace Tee pattern. A tee with a twist, this literally t-shaped garment will layer with the best of them. Lightweight cotton complements the all-over lace for an airy cover that will bring new possibilities to any wardrobe. The Simple Lace Tee is made from two identical pieces worked in a simple open lace from the bottom. A boat neckline, split hem, and 4" positive ease make for a loose and comfortable fit. A cool and lightweight Tanguis cotton and summer linen blend perfect for washcloths and spa gifts and summer knits for children and adults. Tanguis (tan-gwiss) cotton has a very soft hand, excellent absorption and, because it is a naturally white fiber, a high affinity for dyes. The Belgian linen adds the characteristic flecks and additional absorbency with very low elasticity - helping to alleviate stretching in the finished knit. When blended with the already strong Tanguis cotton, it makes a durable, wearable, and soft yarn. The knit fabric will get softer with each wash too. Machine wash gentle and tumble dry low. A Knit Picks exclusive knitting pattern collection. Beyond the heavy days of winter, spring awaits. A time of newness emerging from the soil and for the shedding of old layers. The simple silhouettes of Renew will be the perfect additions to freshen up any spring wardrobe. With 12 patterns ranging from tees to lightweight cardigans, Renew gives you multiple options for refreshing your closet. Simple Lace Tee: Lightweight cotton complements all-over lace for an airy cover that will bring new possibilities to any wardrobe. Made from two identical pieces worked in a simple open lace from the bottom. A boat neckline, split hem, and 4" positive ease make for a loose and comfortable fit. CotLin DK: A cool and lightweight Tanguis cotton and summer linen blend perfect for washcloths, spa gifts and warm weather garments of all kinds. Tanguis (tan-gwiss) cotton has a very soft hand while Belgian linen adds characteristic flecks and low elasticity - helping to alleviate stretching in the finished knit and add excellent stitch definition. Machine wash gentle and tumble dry low. Renew: Beyond the heavy days of winter, spring awaits. A time of newness emerging from the soil and for the shedding of old layers. The simple silhouettes of Renew will be the perfect additions to freshen up any spring wardrobe. With 12 patterns ranging from tees to lightweight cardigans, Renew gives you multiple options for refreshing your closet. A Knit Picks exclusive collection. If you have any questions about this product by KnitPicks, contact us by completing and submitting the form below. If you are looking for a specif part number, please include it with your message.